In an ever changing world of “Hybrid IT”, the major challenge businesses face is maintaining business continuity while simultaneously transforming for the digital future. In this series of posts Chris Parker, Senior Business Development Executive at Fujitsu, offers a new perspective on the way in which hybrid IT and business ecosystems can help you successfully navigate this shift. With an increasingly rich ecosystem of cloud services available across many different business and technology categories there has never been a better time to transform businesses using next generation ‘outsourcing’ and automation. But keeping an existing business running while transforming the underlying technologies is a little like trying to drive your car while simultaneously changing the wheels and tires. It is not a simple task, requiring us to make the best use of both existing and new capabilities without losing the integration necessary to run a coherent organization and deliver value to our customers. Which applications should move to cloud and which should stay on-premise? Which cloud providers are the best choice for specific applications? How do I ensure data and activities flow seamlessly across my on-premise and cloud systems? How do I quickly build, integrate and manage new hybrid systems that span on-premise and cloud resources? How do I successfully manage my total cloud costs to ensure that my transformed operations are sustainable? We can be specific and break down each problem but that would take too long and let’s face it, you are probably already aware of these issues. Instead, it is more interesting to discuss the hybrid cloud technologies that are paving the way to simplifying these challenges. 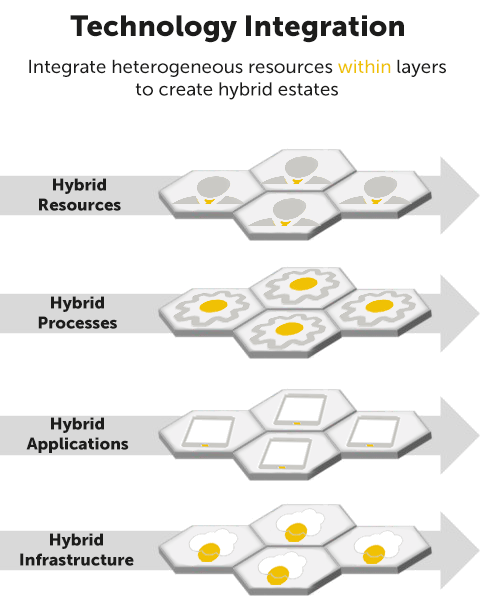 The emerging hybrid landscape will benefit enterprises in astounding ways. For example: cost savings, better control of services, guaranteed governance, baked-in support and business transparency to name just a few. But we also have to stop and think more deeply about the ways in which this technology will benefit the people within our organizations. With that in mind, it is important to understand that transforming your organization to be fit for the digital environment can be a gradual process – it is not a race. By using hybrid thinking you can freely mix and match your approach – externalizing a subset of your infrastructure, subscribing to SaaS services or even outsourcing whole business outcomes to partners – all depending on the needs and maturity of different parts of your business. Today the goal is therefore not upfront perfection of design but movement – it is more important to get started and mix and match the portfolio of services that will optimize your organization for today… while also ensuring you move gradually in the right direction for tomorrow. Hybrid Infrastructure – the underlying technology whether from your own private on-premise cloud, or hosted by a cloud provider, somewhere there has to be some hardware. Hybrid Applications – you probably have on premise applications, SaaS applications, and probably some hosted applications. Hybrid Processes – business processes that may touch many different applications or resources. In our Hybrid IT blog series, we aim to review, discuss and (hopefully) engage in debate about these categories of integration. But the important point to keep in mind is that this isn’t just about technology integration. The ultimate goal of digital ecosystems is a new form of business integration where companies bring resources, capabilities, and technologies together from across the digital ecosystem to increase their value and strategic agility. Hybrid IT and business services are therefore central to the emerging digital future, allowing you to ensure business continuity by connecting resources even as your whole business and technology environment transforms. Stay tuned to the next chapter of this blog series to understand the ever challenging and changing world of Hybrid IT. Want to learn more about how organizations like yours are using hybrid IT to take a fast, evolutionary path to digital transformation?